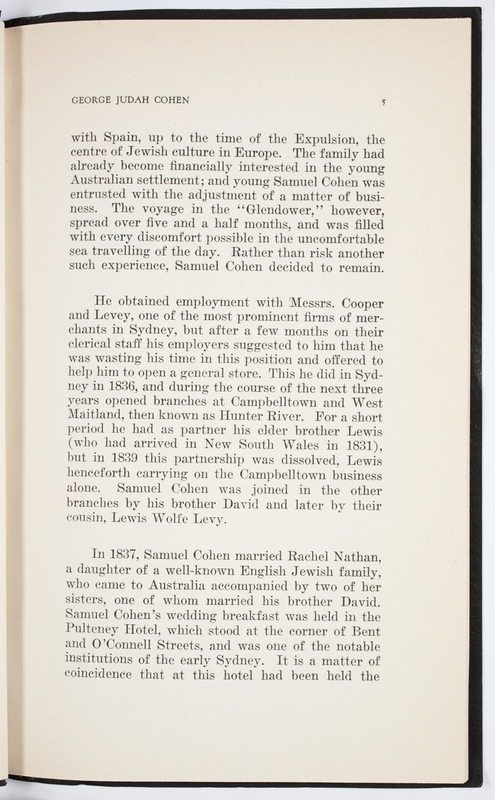 From the First Fleet onwards, Jewish convicts served their sentences and went on to open their own businesses, such as general stores, hotels and tobacco shops. 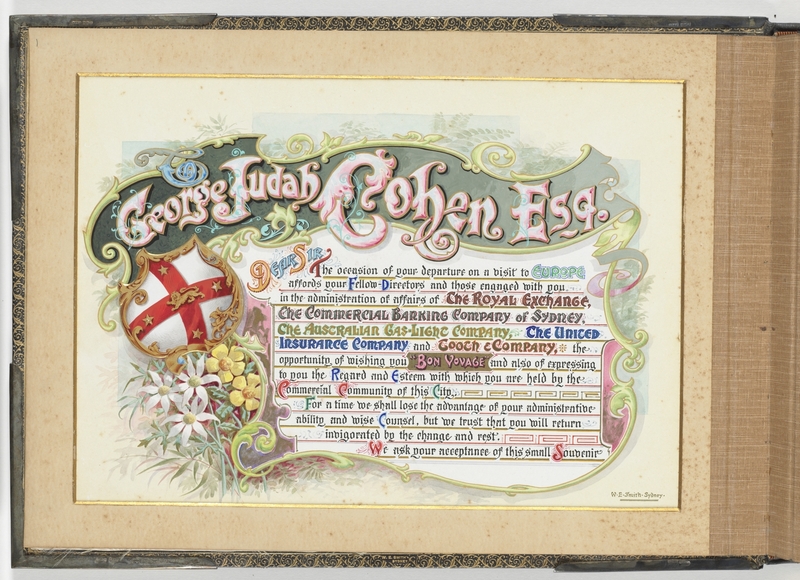 Through the efforts of successful convicts-turned-merchants including Solomon Levey, many more English Jews were encouraged to emigrate to Australia to try their fortunes in business. 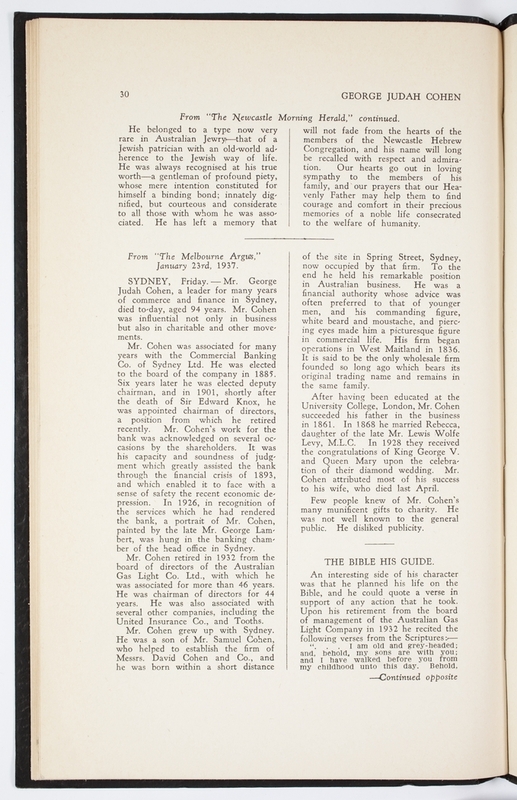 Solomon Levey rose from convict to successful Sydney businessman in the space of a few years. 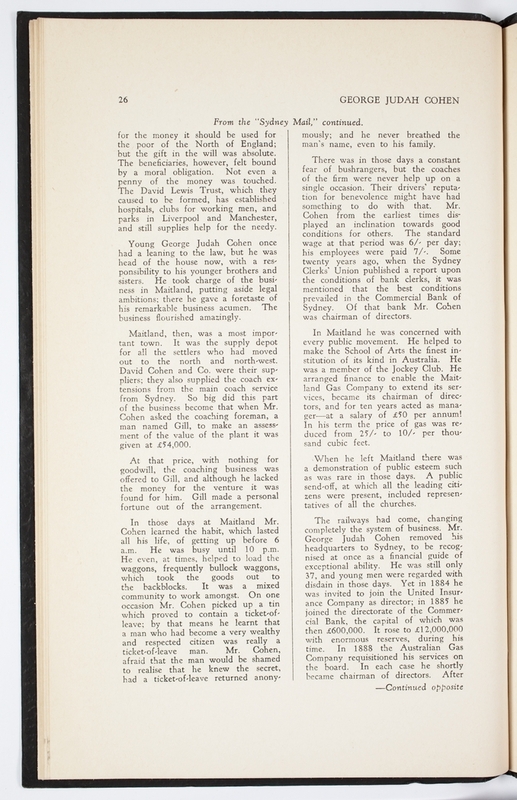 Levey was only 19 when he was convicted for his part in the theft of a chest containing 90 lb (approx. 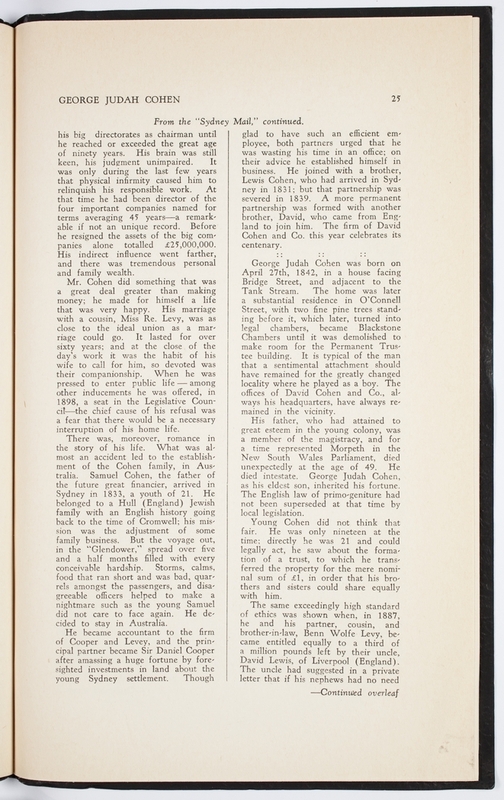 41 kg) of tea, London-born Levey was sentenced to seven years transportation in 1813. 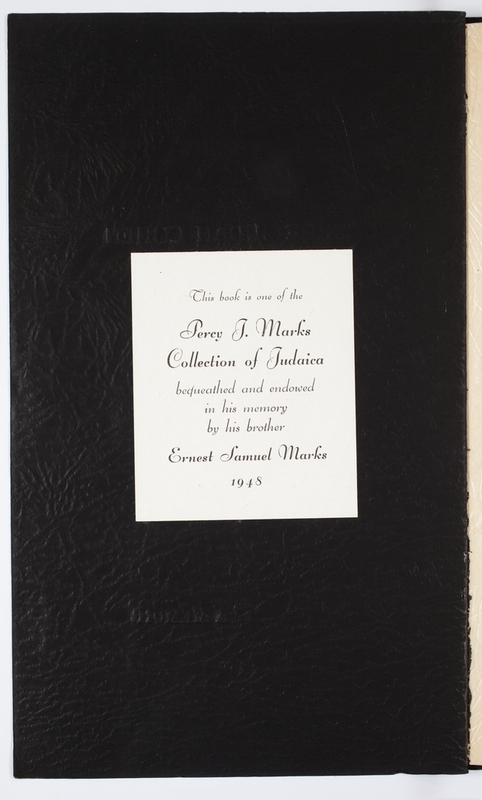 He arrived in New South Wales with seven other Jewish convicts on the Marquis of Wellington in 1815. 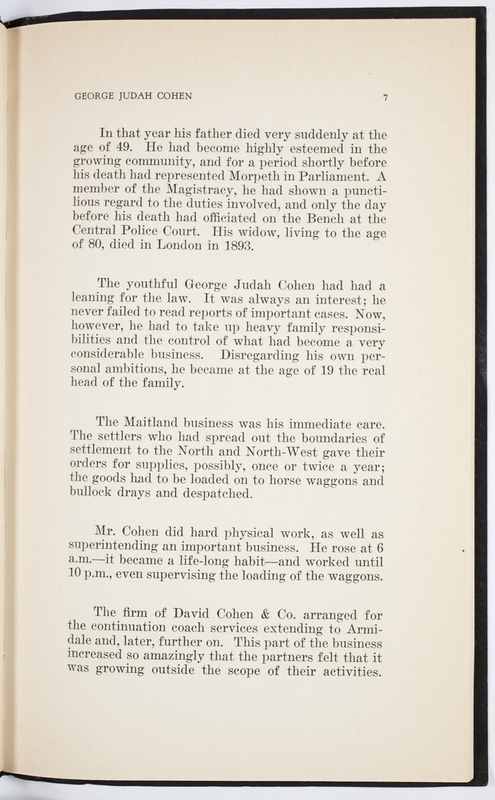 While still a convict, Levey became involved in the local real estate trade and also sold goods to the government stores. 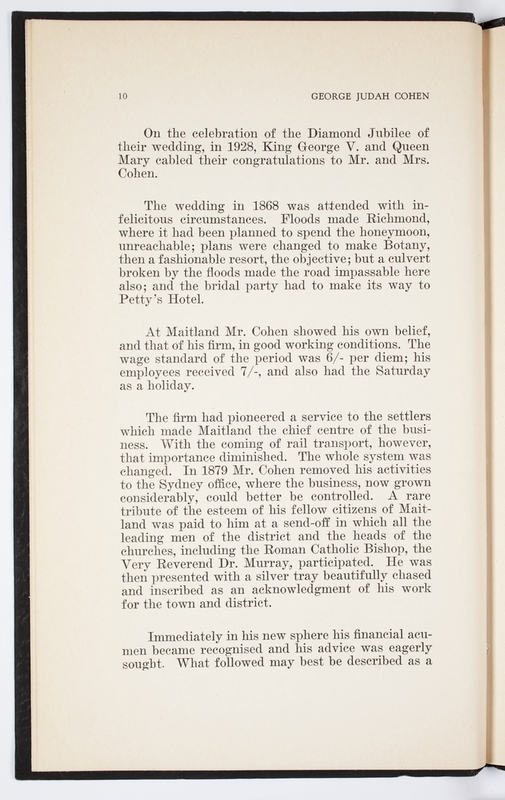 After receiving his absolute pardon, in February 1819 he married Ann Roberts, the daughter of wealthy former convict William Roberts. 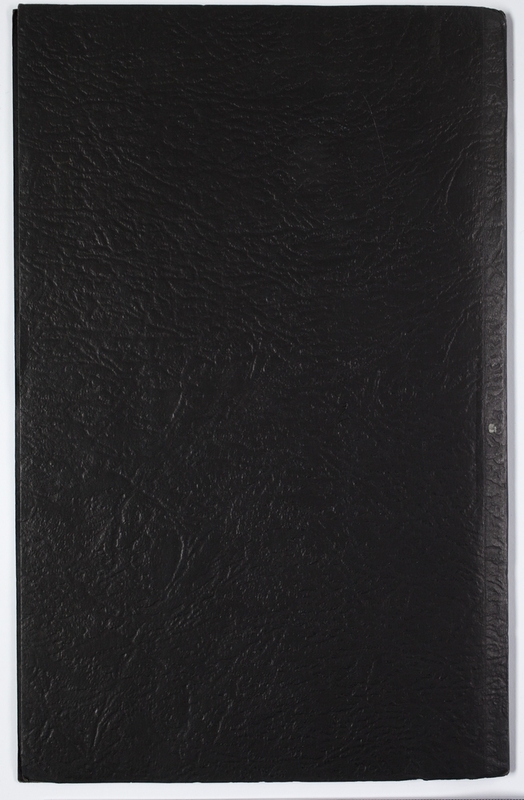 Ann came with an impressive dowry of land and livestock which further extended Solomon's capital. 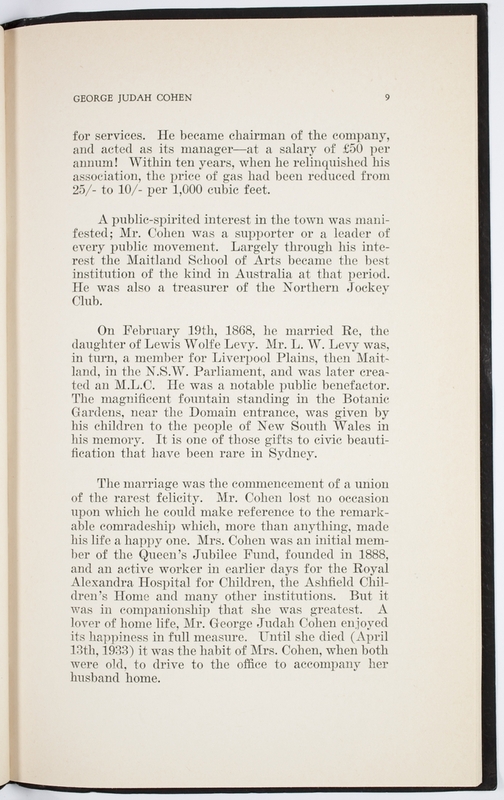 Though the marriage did not last, Levey’s business interests boomed. 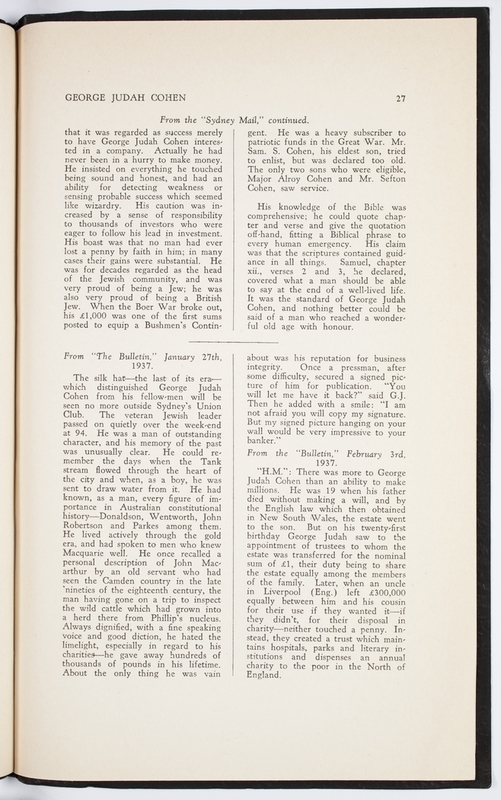 It was during this time that Levey was joined in Australia by his younger brother, Barnett Levey, who became the first free Jewish settler to arrive in the colony. 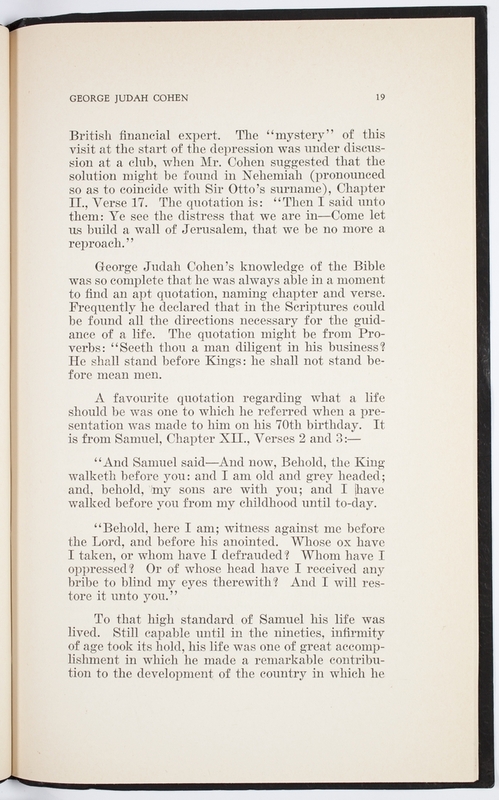 In 1825, Solomon entered into a partnership with Daniel Cooper, another former convict. 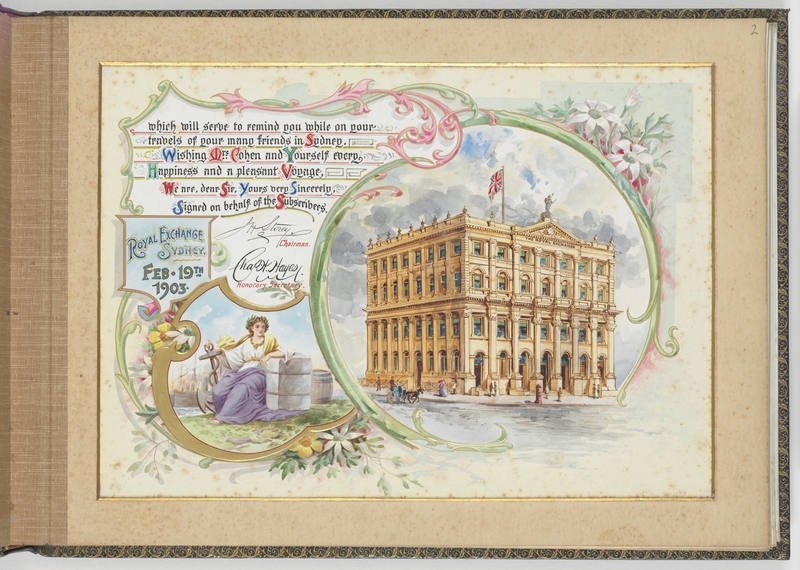 Together Cooper & Levey opened the Waterloo Warehouse where, to manage their way through the colony’s chronic currency shortage, they minted their own banknotes. 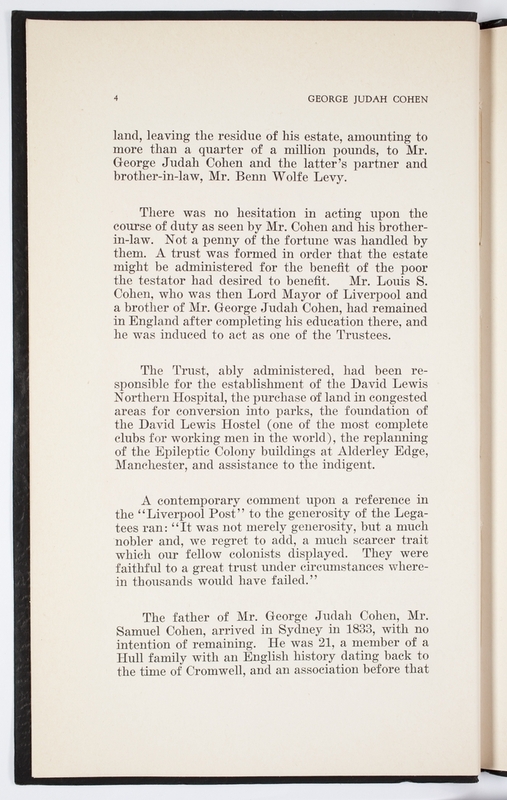 The company also acquired vast tracts of land – from Redfern to Rose Bay – a major triumph was the 1826 purchase of the prestigious Point Piper Estate in Sydney’s eastern suburbs, which was sold by Captain John Piper for a nominal amount as he faced financial ruin. 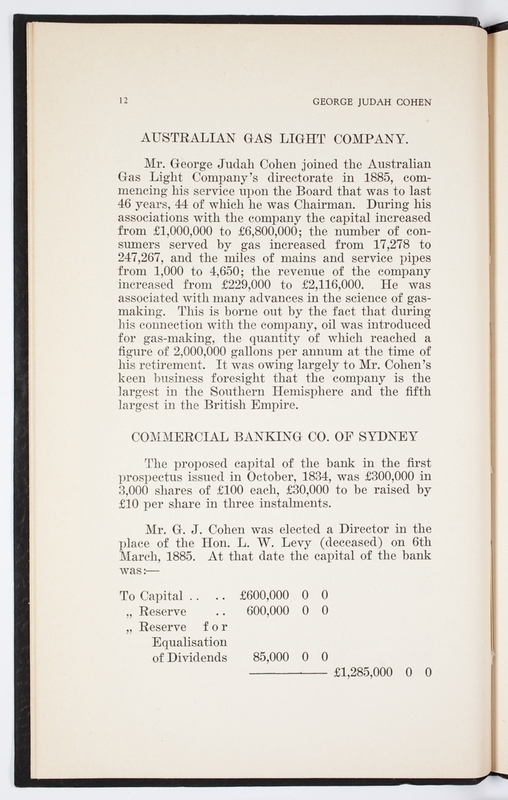 Solomon Levey left Sydney later that year – on a vessel of his ownership – to take on the role as the company's London representative. 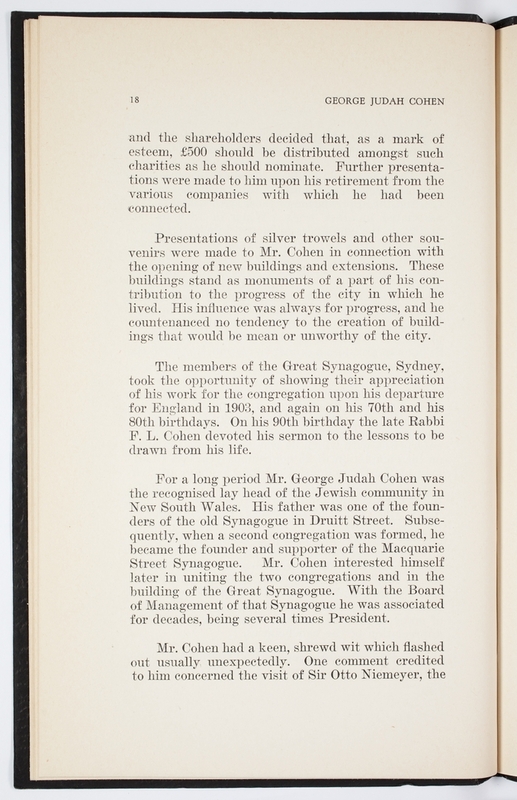 His tales of the wealth and success to be had in Australia convinced many Jews to emigrate to New South Wales, and before too long the number of Jews arriving 'free' had exceeded had those who'd arrived in chains. 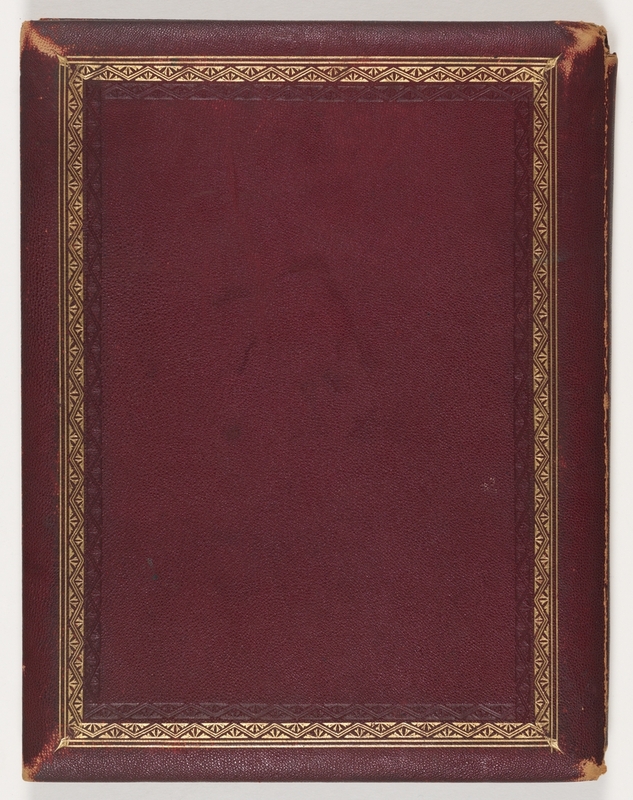 Levey’s most notable venture while in London was his attempt to establish a colony at Swan River, Western Australia. 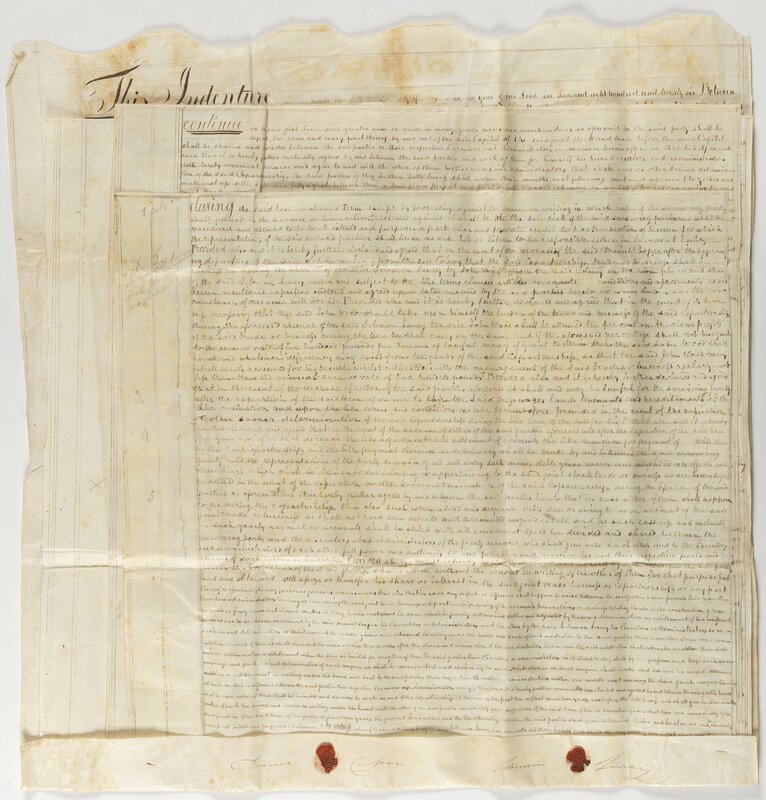 Entering into a silent partnership with Thomas Peel, Levey provided the capital for the new settlement. 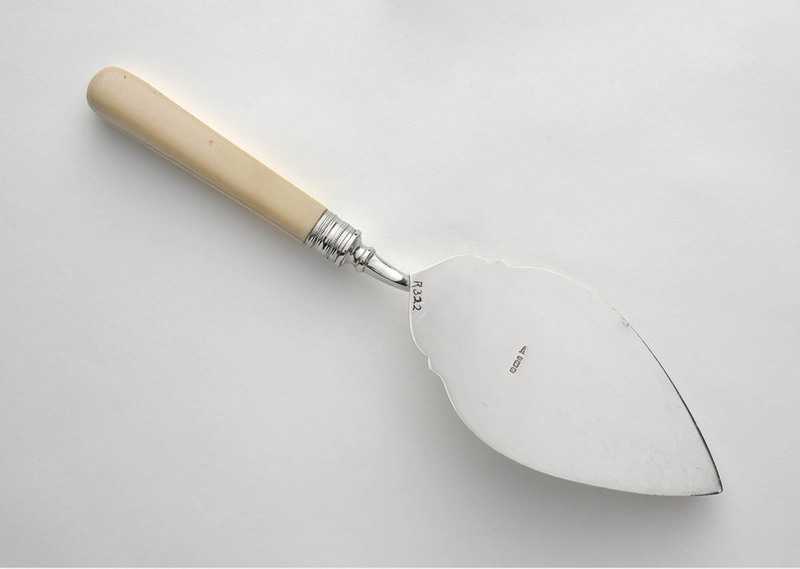 Hardship and financial mismanagement in the new colony, compounded by conflict between Thomas Peel and the Cooper & Levey office in Sydney, saw the scheme collapse within a few years. 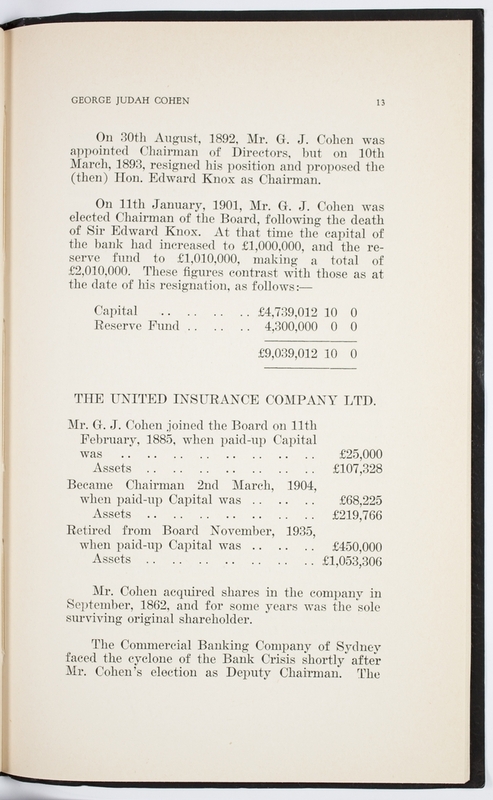 Solomon Levey died in Londodn , remembered as a shrewd businessman who entered into one partership too many. 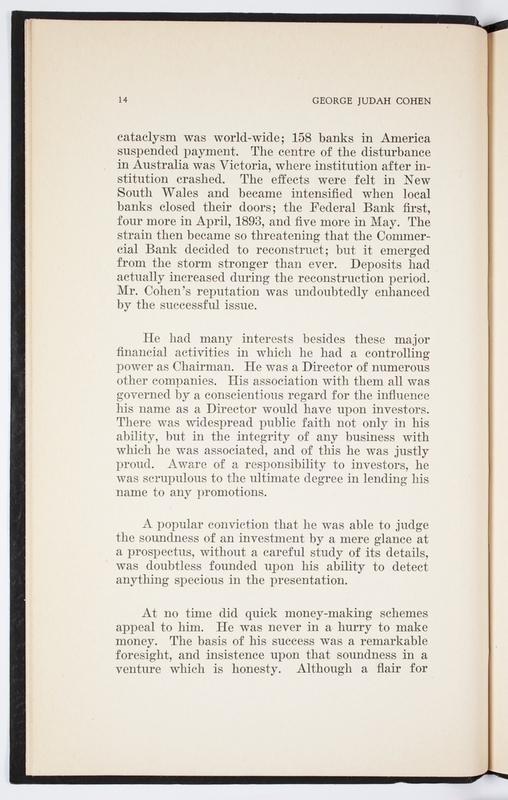 Known as the Wizard of Finance, George Judah Cohen was one of Australia’s most succesful businessmen in the early 20th century. 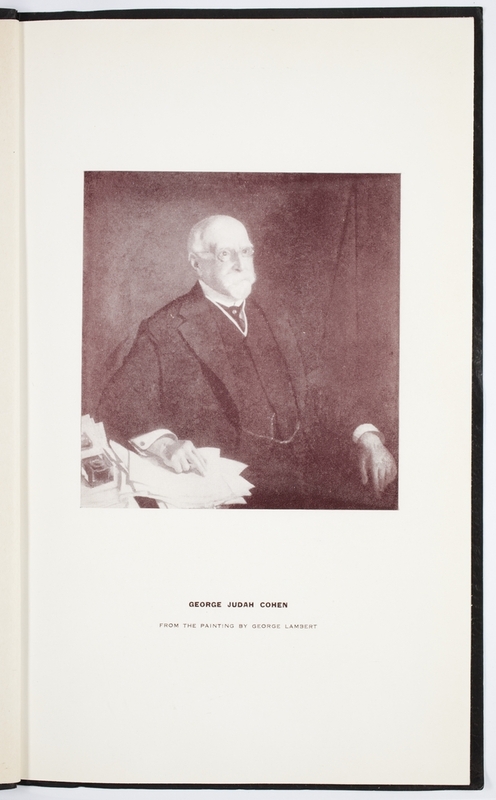 Son of Samuel Cohen, whose wholesale business with his brother David had warehouses in Sydney and Maitland, George was born in Sydney in 1842. 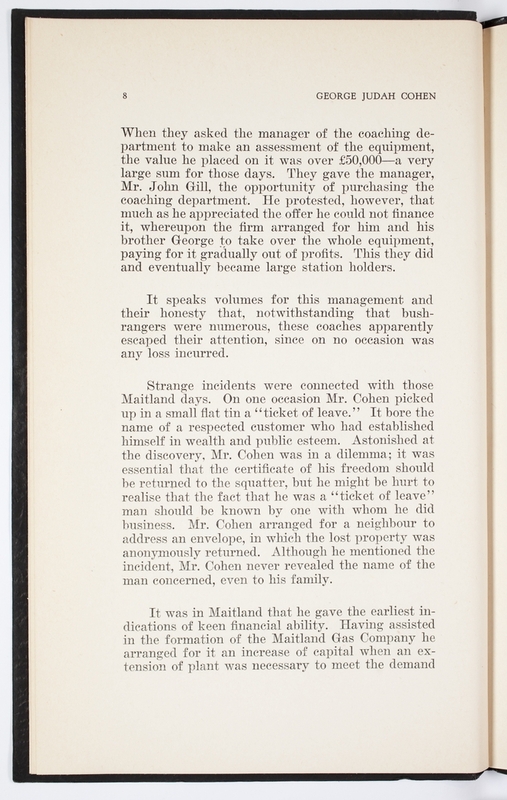 Educated in London, he returned to Sydney and entered the family business upon his father’s death in 1861. 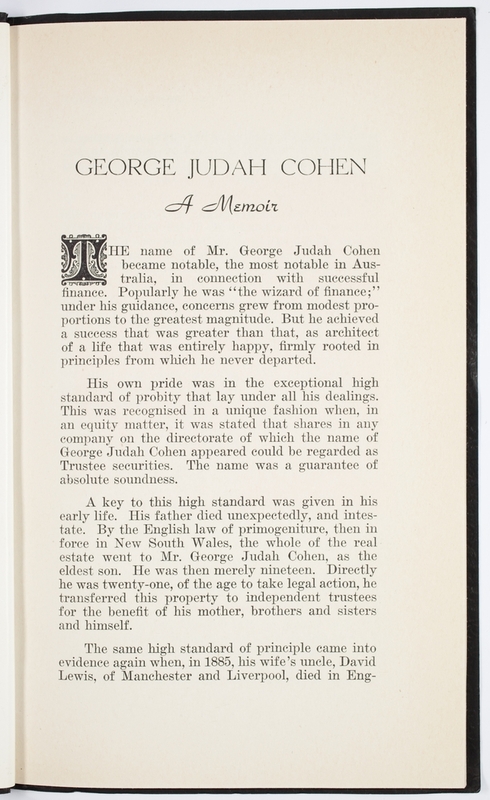 Years of prosperity in Sydney and Maitland saw George Judah Cohen establish a name for himself not only in business but also as a religious and community leader. 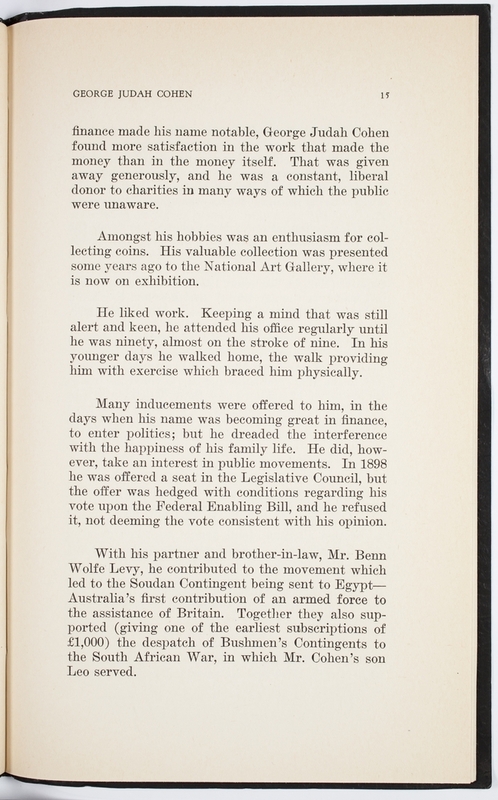 He was actively involved on the board of the Great Synagogue and with organisations such as the Australian Jockey Club and several charities. 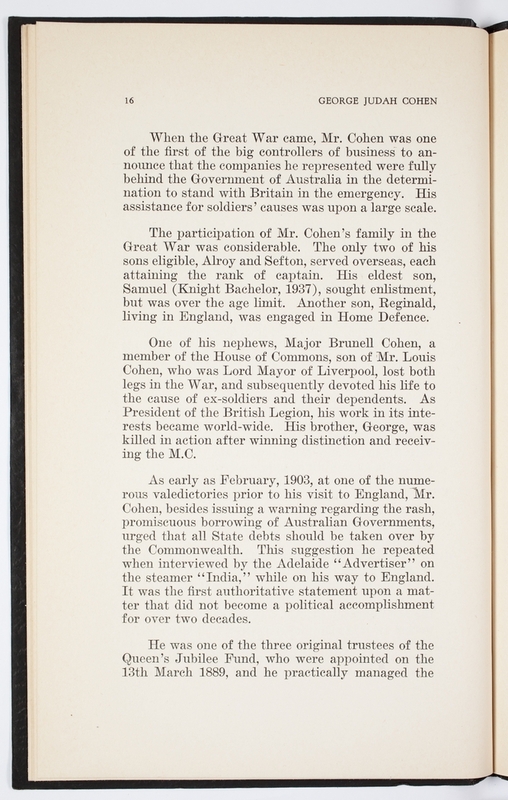 He was tempted to enter politics, but felt that a position in parliament would impinge too much upon his family life. 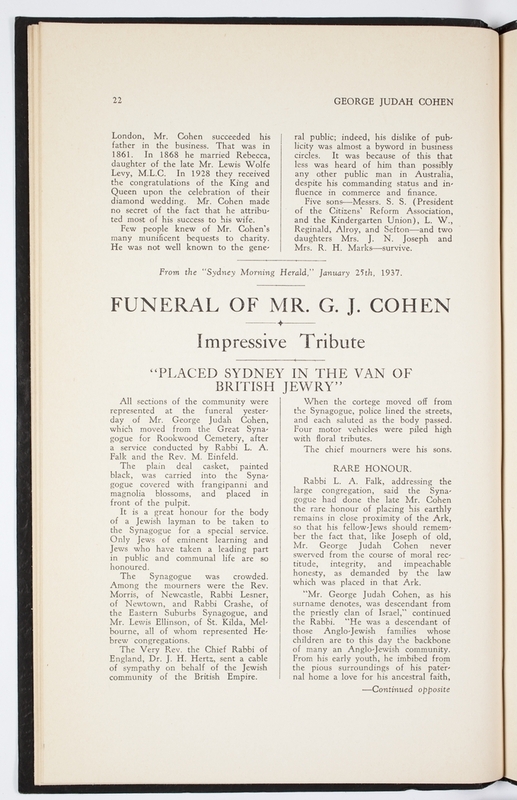 George Judah Cohen is best remembered for his roles as director of several corporations. 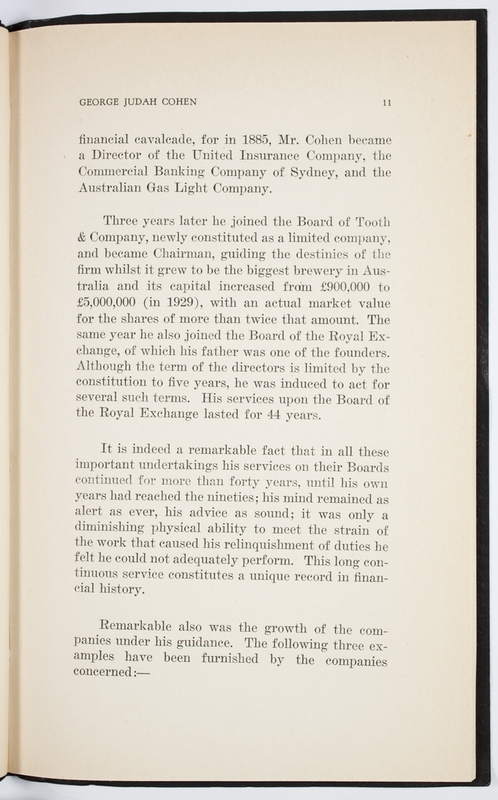 These include the Australian Gas Light Co., Commercial Banking Co. of Sydney, the brewer Tooth and Co. and the Royal Exchange (a precursor to today’s Australian Stock Exchange). 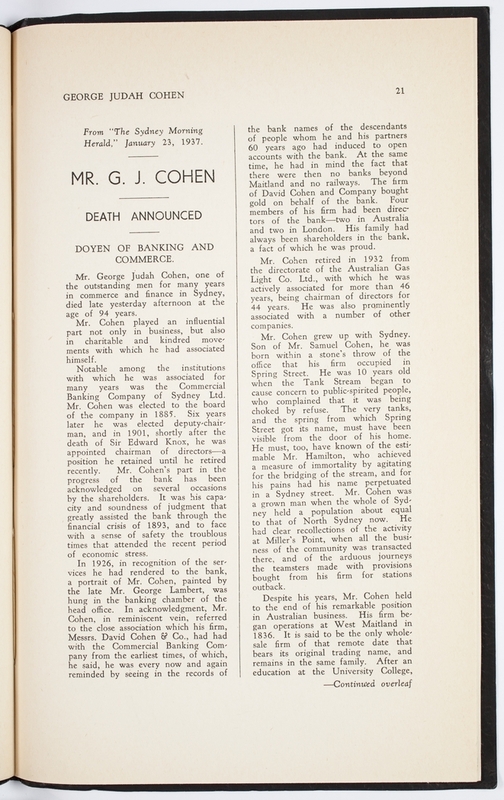 Cohen died in Sydney on 22 January 1937, at the age of 94. 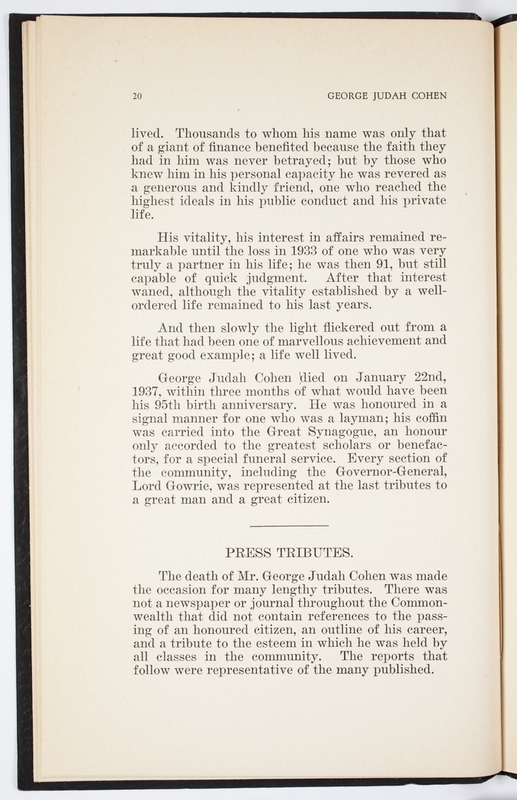 The booklet that appears below was published shortly after his death. 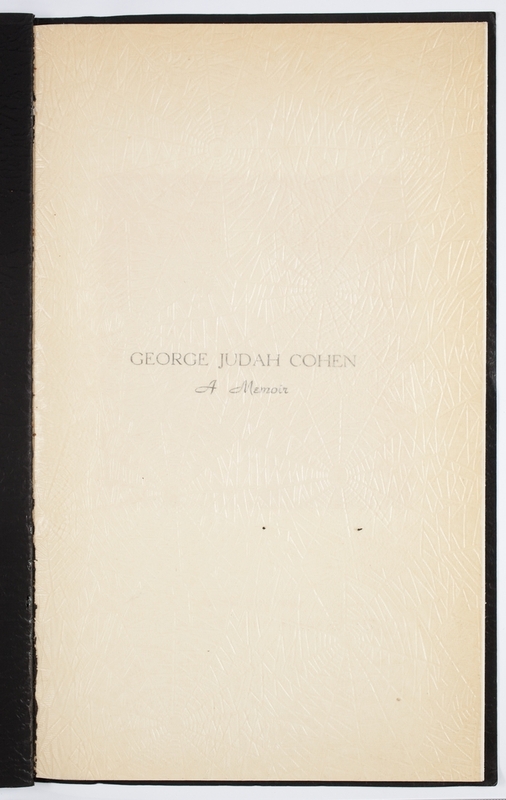 It is a fine tribute to George Judah Cohen’s life and achievements, and it features many touching remembrances from those who had known him. 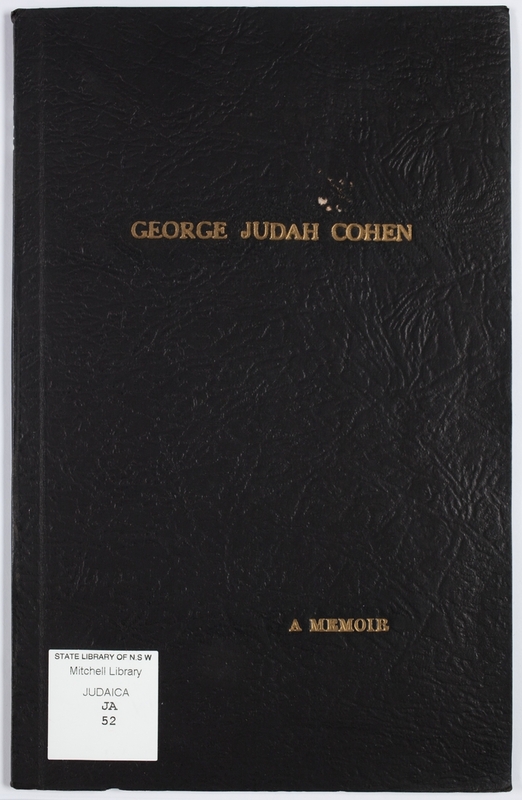 George Judah Cohen : a memoir. 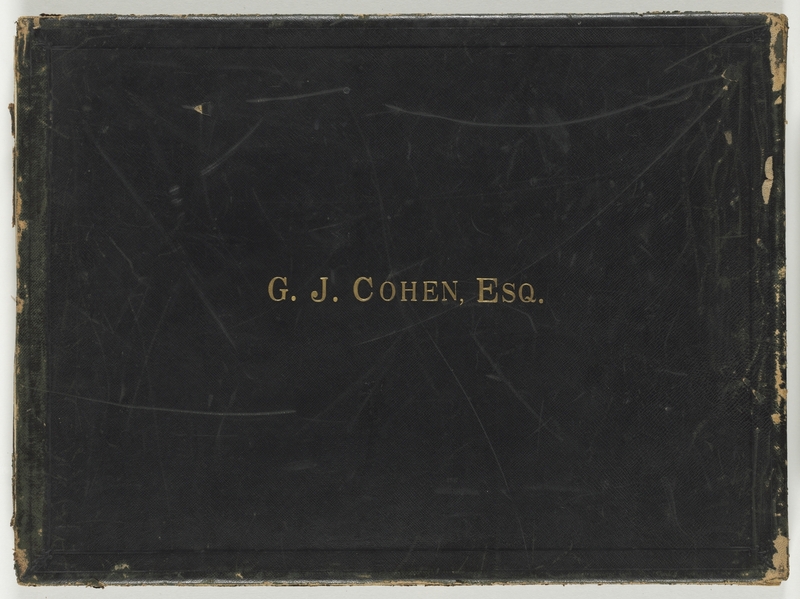 This album was presented to George Judah Cohen as he left Sydney to visit Europe with his wife in February 1903. 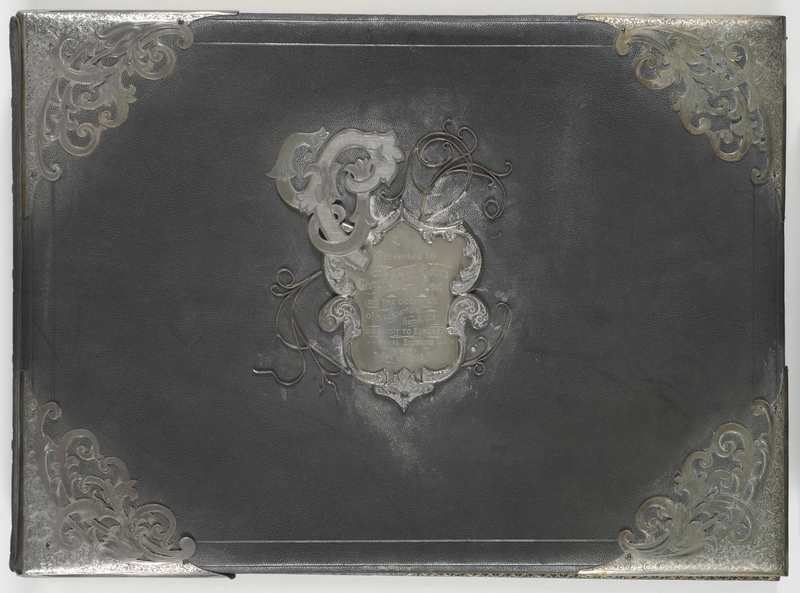 Illuminated addresses were typically presented to distinguished individuals as tokens of esteem and respect. 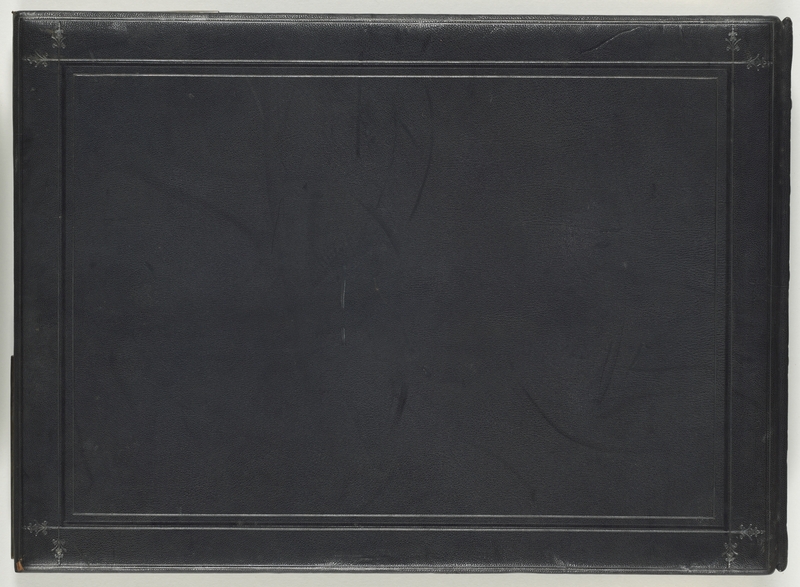 This elaborate volume contained not only an illuminated address (shown below) but also 34 large photographic prints. 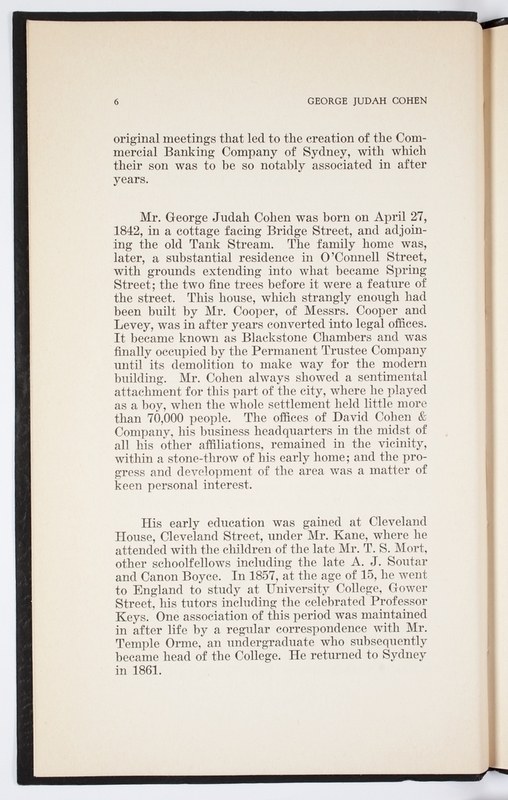 They show Sydney landmarks including the Royal Exchange, where Cohen worked, and the Great Synagogue, where he worshipped. 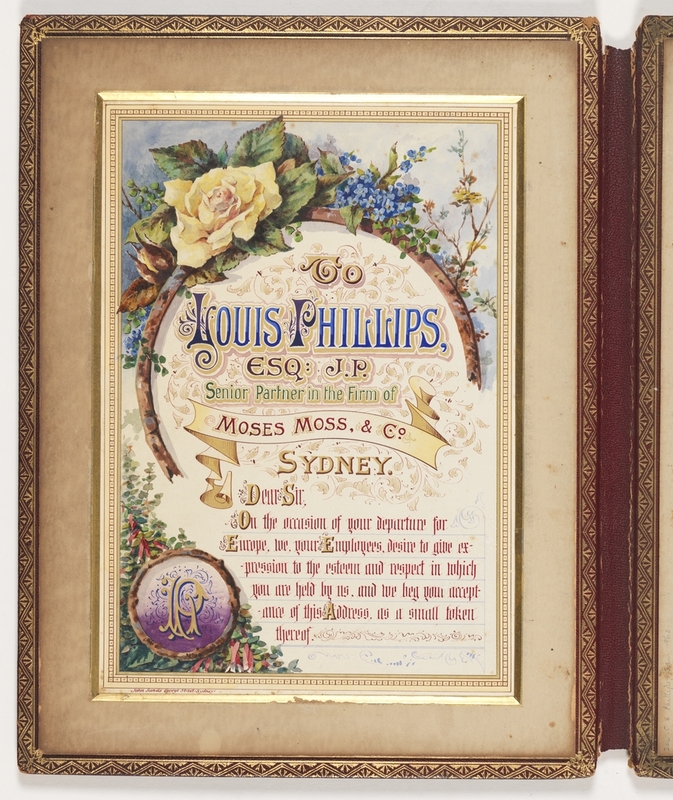 Businessman, philanthropist and Jewish community leader, Louis Phillips was born in London circa 1838. 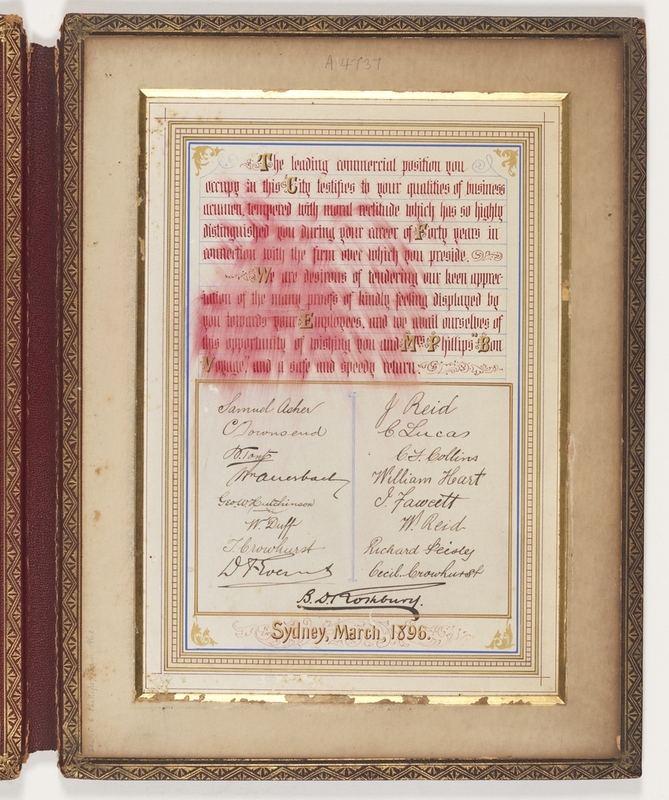 He arrived in Sydney in 1856, while still in his teens. 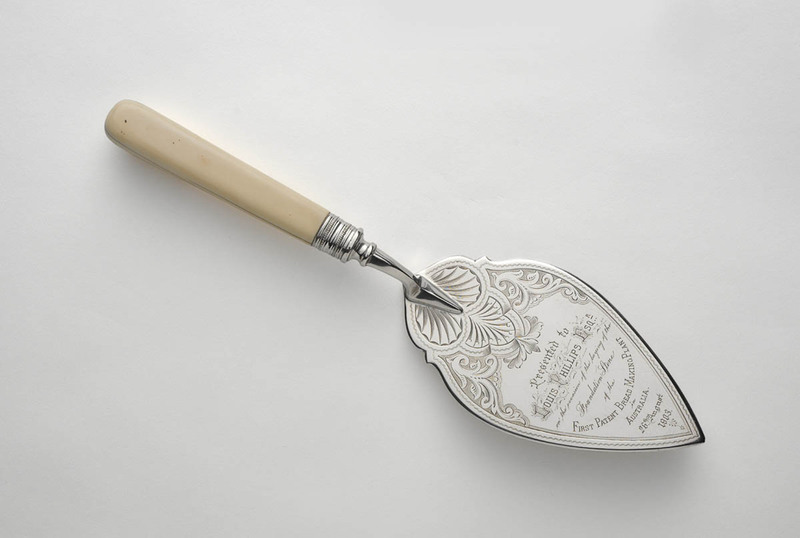 He immediately took up work with the Sydney merchant Moses Moss, and within five years he was a partner in the company. 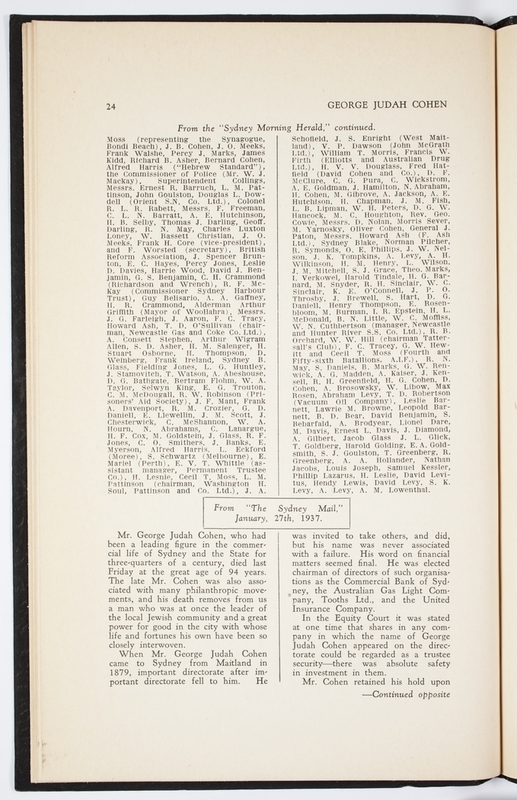 Besides his work with Moses Moss & Co. – of which Phillips remained a director until his death – he became a director of several companies including the Australian Joint Stock Bank, Model Lodging House Company and Pacific Fire and Marine Insurance. 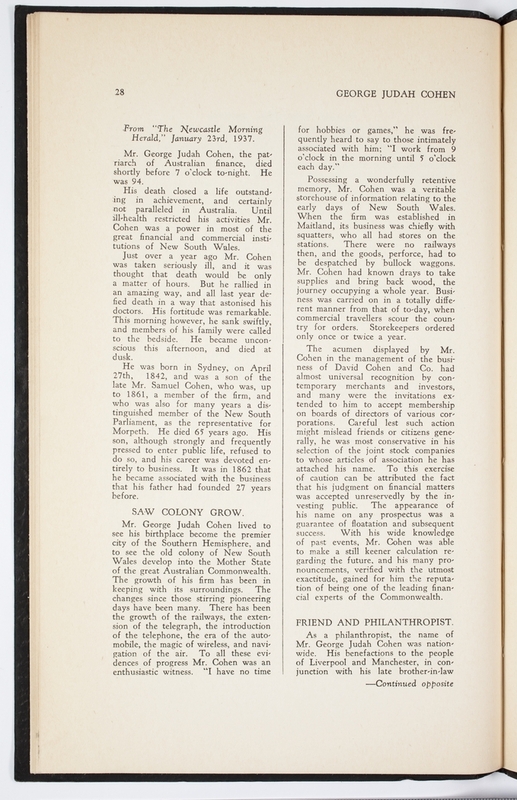 All the while, Phillips maintained a strong commitment to community work. 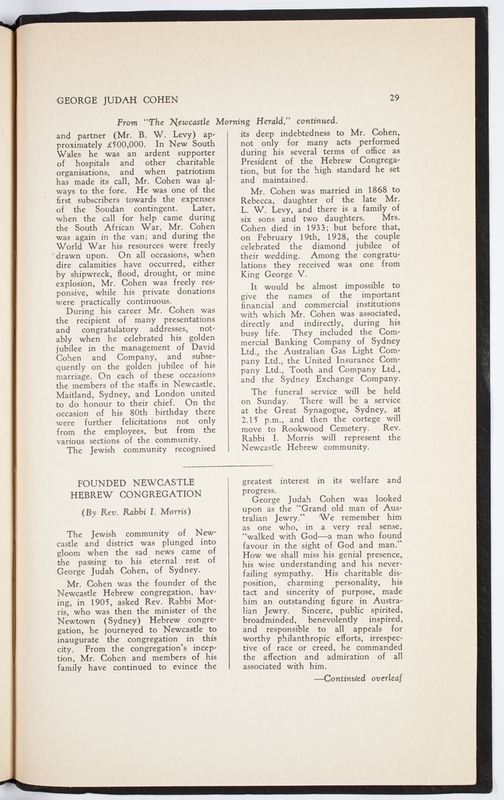 He volunteered for Jewish welfare organisations including the Jewish Orphan Society and the Sydney Jewish Sabbath School. 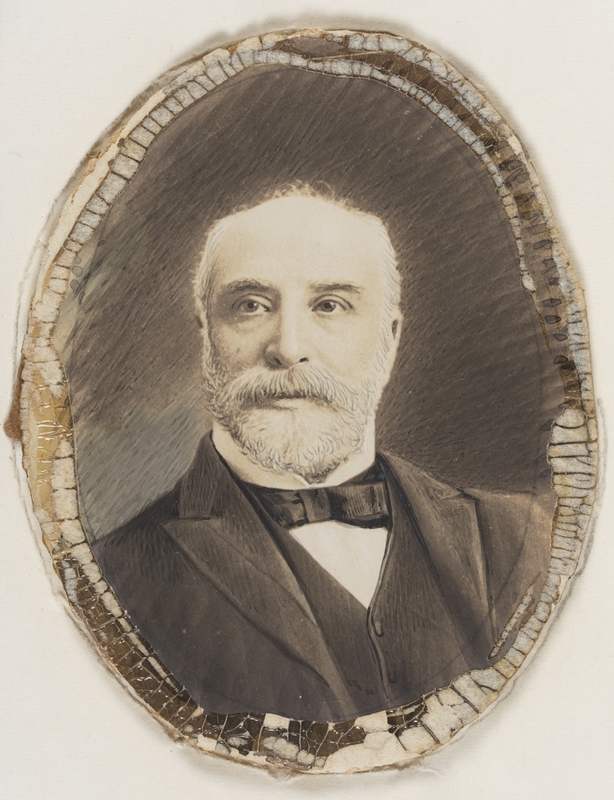 Phillips was on the board of management of the Great Synagogue for 40 years, including ten years as president. 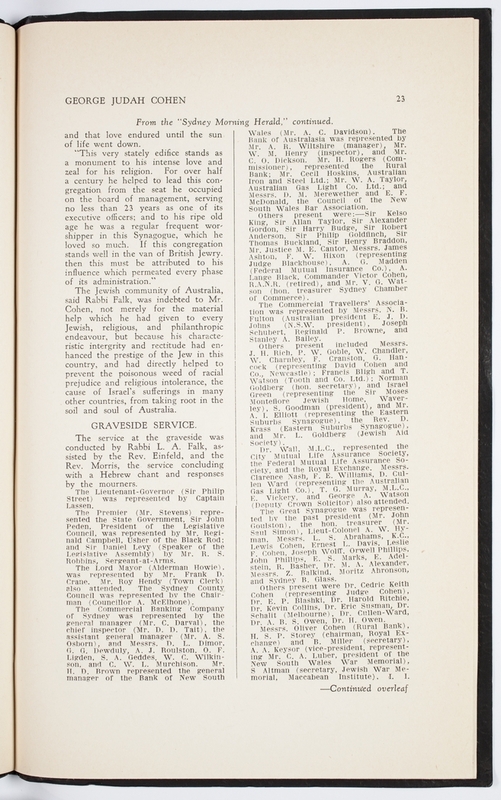 He was also committed to organisations focusing on the wider community. 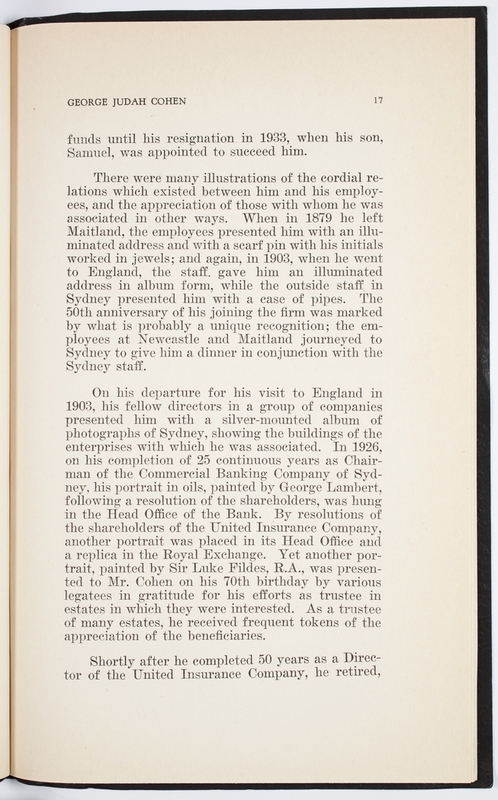 This included the roles of director of Sydney Hospital and president of the Prisoners’ Aid Association of New South Wales. 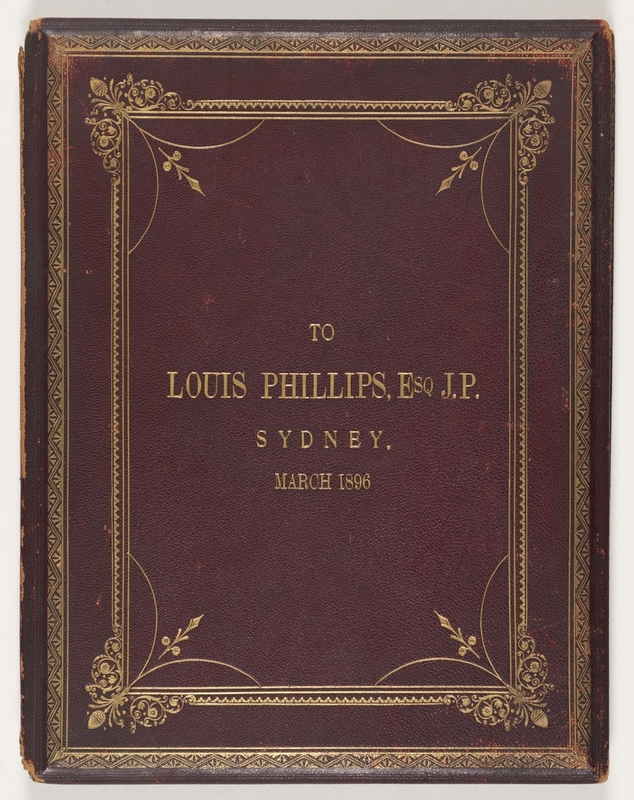 Louis Phillips died at his residence, Orwell in Potts Point, on 6 November 1913. 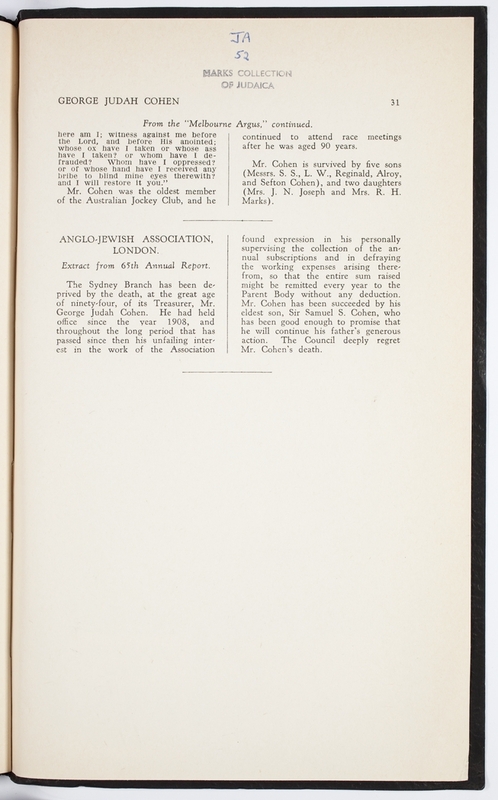 His sons, among them Orwell Phillips, followed in their father’s footsteps with successful careers in business with a similarly strong commitment to the religious affairs of the Jewish community.